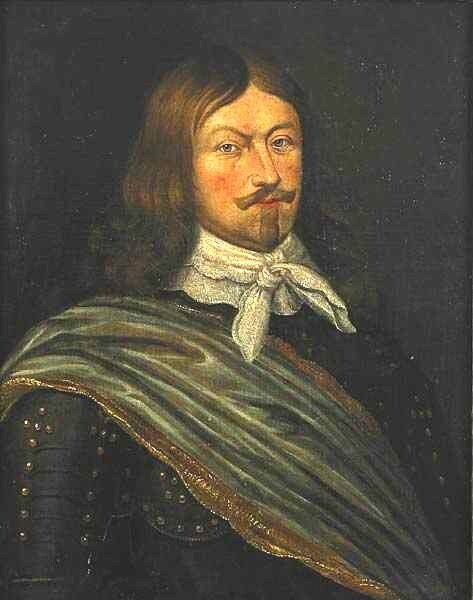 Lennart Torstensson (1603-1651) became one of Sweden’s greatest military heroes during the Thirty Years’ War. He led Swedish artillery forces at two notable battles in the early 1630s. For the next several years, Torstensson commanded vast numbers of troops during battles and sieges stretching from the forests of Silesia (now Poland) to the Danish peninsula to as far south as Vienna. In his native land he was the celebrated war hero called “Blixten,” or “lightning” in Swedish. Torstensson was born on August 17, 1603 at his family’s castle, Torstena, in West Goteborg, the southern part of Sweden. Torstena was near Vanersborg, a town on Lake Vaner. Adopted as an infant and raised by his grandmother, as a result of his father’s forced exile, Torstensson was also brought up by a paternal uncle who paid for his schooling. He proved to be an intelligent youth, as well as disciplined and obedient. This attracted the attention of emissaries from the royal court in Stockholm. At the age of 15, Torstensson became a page in the service of King Gustavus Adolphus, a position also called squire of the chamber. Three Decades of Bloodshed 1618 marks the onset of the Thirty Years’ War, a battle that pitted several German Protestant princes, allied with various European powers, against the Catholic Hapsburg dynasty and its powerful ally, the pope in Rome. The Holy Roman Empire, with its base in Vienna, held the lands of Austria, Spain, Bohemia, much of Italy, and the lower half of the Netherlands, as well as significant portions of Germany that were still Catholic. Gustavus Adolphus, then in his early twenties, was already considered to be one of Europe’s most dynamic young rulers and military commanders. His Lutheran beliefs, as well as blood connections to one of Germany’s Protestant princes, made him eager to ally against the Imperial forces of the Holy Roman Empire. Torstensson’s career would revolve around these political goals of his king. Should Gustavus Adolphus succeed in leading the Protestant lands to victory, it was rumored that he might be installed as the first Protestant emperor of the Holy Roman Empire in its post-Hapsburg phase. Torstensson was likely privy, in the early 1620s, to some negotiations concerning Sweden’s future during missions to Germany and Holland in the service of the king. After a stint in the Swedish navy, Torstensson was promoted to the rank of ensign, after performing outstanding deeds as an aide to Gustavus Adolphus during a 1624 campaign in Livonia (present-day Latvia and Estonia). Torstensson fought alongside the king in several such battles against the Poles and Imperial Russia in the Baltic lands. In 1626, his leadership skills as head of a regiment in Gustavus Adolphus’s invasion of Prussia won him a promotion to captain. After another advancement to colonel and then a truce, Torstensson was made Great Master of the Swedish Artillery in 1629. He had no formal military training, save for practical battlefield experience. During this quiet interim in Stockholm he likely schooled himself in the new weaponry and techniques introduced recently to the Swedish military. During his battle for the Baltic port of Riga, Gustavus Adolphus had introduced several new military techniques gleaned from a tour of Germany a few years earlier. The king read widely on military matters, and was eager to modernize Sweden’s army. He reduced the depth of the battlefield formation from ten to six ranks, for instance, and introduced several lighter pieces of artillery that were far easier to transport across long distances-and in the heat of battle, too. He also created a brigade designed for tactical moves, and instituted a strict policy of discipline and busy- work for his soldiers. When not fighting, they were expected to train. One of the fearsome techniques they perfected was the double salvo, in which the first row of men fired while on their knees, the second while crouching, and the third standing upright. Torstensson spent his army career both learning such deadly maneuvers, and then leading troops well-trained in them as well. In June 1630, Gustavus Adolphus invaded Germany. Historians mark this act as the true escalation of hostilities in the Thirty Years’ War. France-largely Catholic, but foes to the Hapsburgs nevertheless-provided subsidies to help this new campaign. The army of Gustavus Adolphus, after allying with Saxony, scored its first major victory at Breitenfeld in September 1631-a battle in which Torstensson played a leading role. At the next major battle the following year at Lech, Torstensson again was integral to the Swedish victory. At Nuremberg, Torstensson fortified the city so well that the generals of the Imperial side initially decided not to risk an attack. But on St. Bartholomew’s Day-August 24, 1632-an alleged deserter arrived and informed Gustavus Adolphus that the Imperial officers were about to give up. Accordingly, the king instructed Torstensson to lead the assault, but it was soon apparent that they had been disastrously lured into battle. In the ten-hour crisis, 5,000 casualties decimated the Swedish army, and Torstensson was taken prisoner by Bavarian regiments. He was incarcerated at a fortress in Ingolstadt, a city between Nuremberg and Munich. Little mercy was shown him, despite the luxurious treatment that high-ranking prisoners of war often enjoyed during such stints in enemy hands. He was held in a dank underground cell, where the saltpeter (a gunpowder additive) contamination of the soil ruined his health. He developed rheumatism, and then gout, characterized by painful flare-ups of arthritis. Attempts by Gustavus Adolphus to pay a ransom for Torstensson were initially rebuffed by the Bavarian prince. He was finally exchanged for a high-ranking Imperial minister in 1633. While Torstensson was in Ingolstadt, Gustavus Adolphus had been killed on the battlefield at Lutzen in November 1632. Devastated by the loss of his mentor, Torstensson was able to make it to the Baltic port of Wolgast in time to join the ship carrying the king’s body back to Stockholm. He carried the state banner at funeral in the procession to the city’s Lutheran seat, Riddesholm Church. After recuperating for a time, Torstensson returned to Germany with a new force of 20,000. During much of the 1630s, Torstensson and the Swedes battled Imperial forces or laid long sieges. As one of its top commanders, Torstensson also worked to stamp out the occasional mutinous uprising; conditions were often abysmal for soldiers, and they sometimes rebelled after long periods without pay or decent food. In one instance, a cache of letters was discovered in a stable-legendarily, the finder had been alerted by a kitten’s playfulness. In reading them Torstensson realized that one of his colonels had been corresponding with the enemy. A large contingent of his men was hoping to desert for better pay and food promised by the other side. Torstensson had the colonel arrested, tried for treason, and executed. With this act, his investigation into the mutiny was concluded. He believed that an example had been made, and that any further inquiries would only cause deeper rifts. After the death of Johan Banér, his superior, Torstensson was named commander of the Swedish forces in 1641. The following year he led an assault into Silesia, and from there achieved a number of successes across Moravia and Bohemia. By now, however, Torstensson’s gout had become so acute that he could not even write his name, though he was not yet forty. During a second battle at Breitenfeld in 1642, both he and the Crown Prince, later crowned Charles X, were unhorsed by enemy fire. It was a terrible battle, and some Swedish soldiers abandoned their positions entirely. But in four hours, they slaughtered 5,000 enemy forces and captured 2,000. From there Torstensson and his army laid siege and plundered the city of Leipzig. Battles in Bohemia were next on the anti-imperialist agenda; France had now joined Sweden in the all-out war to vanquish the power of the Hapsburgs. In January 1645, Torstensson led a force of 15,000 men into the decisive battle at Jankau (Jankov, Jankow), near Prague. There they emerged victorious, though it was a tenuous situation and even Beata fell into enemy hands for a brief period. From there, they advanced southward toward Vienna, and planned to conquer the capital city when reinforcements of Transylvanian troops arrived to help. They never did; the Transylvanian count had changed his mind and decided to remain on the Imperial side. Torstensson did manage to lay siege to settlements outside Vienna during several months in 1645. When he learned that his army battalions outside Vienna were under attack, Torstensson marched back 2,000 citizens, burghers and peasants alike, as an advance army; nearly all of them died. It was summertime by then, and the unburied dead lay rotting in the fields, which made the threat of disease and pestilence great. Torstensson called an armistice so that his troops might bury them. The agreement was broached, and his army was attacked. A plague did break out, and an angry Torstensson ordered that villages be burned in retaliation. The fires were visible from the highest point in Vienna, the dome of St. Stephen’s church. The emperor then sent 35,000 troops to vanquish Torstensson and his 10,000 men. His health in rapid decline, Torstensson relinquished command of his army on December 3, 1645. He spent the winter in Leipzig, but issued commands from his bed to Gustav Karl Wrangel, his handpicked successor. He sailed back to Sweden in September 1646, and was too ill to even present himself at court before Queen Christina. His son went in his place, and received from the Queen a decree naming Torstensson as Count of Orlala. He was also given the governorship of West Goteburg, and took up residence in the vital port city of Goteburg itself in May 1648. Torstensson traveled to Stockholm one final time, in October 1650, for the Queen’s coronation. The trip finally decimated his already-weak health. He was given quarters in the royal palace, where he died on April 17, 1651. A massive funeral was held in his honor, and cannon salvos resonated across Stockholm all day long as tribute to him. He was buried in the Riddesholm crypt, the resting place of Sweden’s kings, distinguished government ministers, and heroic military leaders.